Yes, this includes one 40V battery (WA3580) and one charger (WA3747). How much does the 40V 12” Cordless Chainsaw weigh? The Worx 40V 12” Cordless Chainsaw weighs 7.9 pounds, less than a gallon of milk, even with the battery installed! How powerful is the 40V 12”Cordless Chainsaw? The 40V Worx MAX Lithium battery included with the 12” Cordless Chainsaw is the same battery we trust to power our 40V Cordless Mower, TURBINE40V Blower, 20" Cordless Hedge Trimmer, among others, like the Hydroshot. Since the battery can stand up to those high-powered applications, you can trust it to keep up with you. What’s the runtime for the 40V cordless chainsaw? The runtime will vary depending on the type and density of wood you’re cutting and how thick the branches are for each cut. For example, on one charge of our 2.0Ah 40V battery, you can expect up to 23 cuts on 6” thick hardwood. Since most branches you’ll cut are less than that, you’ll typically get a much higher yield. The enclosed charger and battery take about 8 hours to fully recharge. Does this use the same batteries as my other 40V WORX tools? Yes! With 40V Share Volt, you can share the battery and save money. Your Worx 40V 12” Cordless Chainsaw can use any WORX 40V battery you already have. By sharing the battery between tools, you’ll always have the power you need to complete any job. Our 40V lithium tools and Ni-Cd tools are separate platforms and are not interchangeable. Lithium batteries offer our customers maintenance-free technology without the hassle of managing the memory effect inherent in Ni-Cad batteries. Are the 40 Volt Max Lithium batteries interchangeable with the 20 Volt Max Lithium Battery? While 40V Share Volt and 20V Power Share allows you to share batteries between tools within the same voltage family, batteries should only be used with tools of a corresponding voltage. Use your 40V Max Lithium battery with any 40V WORX tool – even the garden tools – but save your 20V battery for your 20V tools. The chain speed is 14.8 ft/s. The 40V Cordless Chain Saw can take any kind of bar and chain oil, which is available in most hardware stores or stores that sell chainsaws. The oil tank capacity will hold 4.5 ounces. How many chain drive links are on the 40V Cordless Chainsaw chain? What is the chain pitch? What is the chain gauge? There are 40 links on the 12” Cordless Chainsaw chain. The chain is a 3/8 inch pitch and has a gauge of 0.043”. 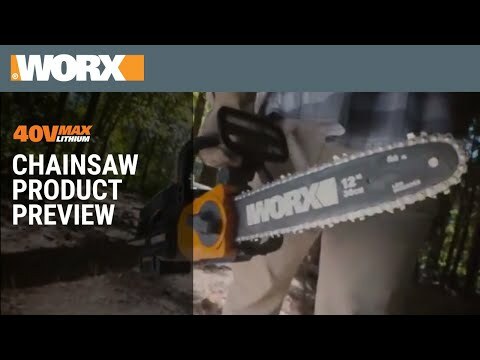 Local hardware or home improvement stores may carry accessories that fit your Worx chainsaw. Look for the following items compatible with your WG380 40V 12” Cordless Chainsaw. Carefully review the owner’s manual for all safety information and guidelines for the Cordless Chainsaw. Follow safety precautions while using any power tools – including wearing safety eyewear, gloves, appropriate shoes & clothing, and keeping hair tied back. See the owner’s manual for complete safety instructions and details. If you decide the Worx 40V 12” Cordless Chainsaw isn’t the right tool for you, we offer a 30-day Money Back Guarantee from date of receipt (less shipping and handling). Please call our customer service center at 1-866-354-9679 (WORX) and we’ll be happy to assist. View more information here. We know your tools are indispensable, so we cover each tool with a 2 Year Limited Consumer Warranty. You can extend your warranty to 3 years by registering online within 30 days of purchase. Already have your 40V Cordless Chainsaw? Register now! 40V Share Volt 12" Cordless Chainsaw with Auto-Tension is rated 4.8 out of 5 by 75. Rated 5 out of 5 by Randell from Works great Trimmed my large fig tree and crepe myrtle with ease.. some branches 8" in diameter. Battery life is very good. Also have a worx blower and trimmer. Reach have their own battery. Rated 5 out of 5 by Fmurph11 from Very surprised Bought it for Christmas. Very surprised at how well it does. Rated 5 out of 5 by 60Wiley from Great Product The chainsaw is lightweight and very easy to use. Perfect for small limbs.